The Google figure of 7 million titles is based on the claims that have recently been made about the number of titles which they have added to Google Book Search through their library project (“and we’re just getting started”). 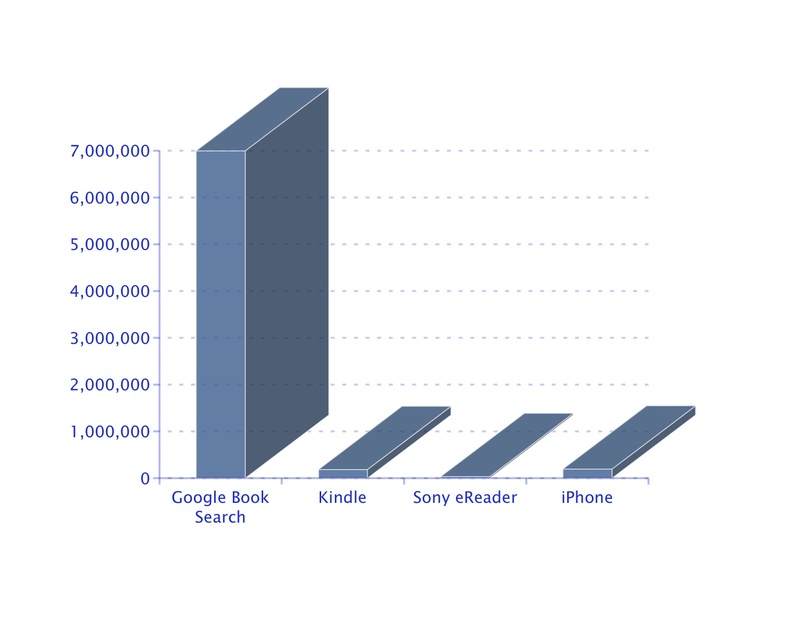 While it is true that the figures are not strictly comparable (and my guess for the iPhone is highly conjectural) the graph is telling. Google has a huge arsenal of titles in digital format and once they have a functioning way of licensing and selling access to their resources the Google Book Search library will dwarf all others. Some people might read this graph and, shrugging shoulders, say that Google is the only game in town. But that does not seem quite right. A more balanced response would be to start with the proposition that any good digital books strategy is going to work alongside Google Book Search. The best strategies will work with it, even take advantage of the fact that it works to everyone’s advantage.